As part of our 2012 catalog, we are pleased to offer the Nitro 2-piece fire suit. This combo, which features a pair of Nomex pants along with a Nomex jacket, is an SFI 3.2A/15-rated design that is ideal for drag racing and sprint car applications. If you compete in any motorsport series that does not require a full suit, the Nitro 2-piece fire suit is well suited for you – it provides comparable protection at a competitive price. Safety – Featuring Dupont Nomex throughout for the best in protection, our Nitro 2-piece fire suit exceeds the TPP rating for SFI 3.2A/15 needs. It is designed to provide maximum protection at a competitive price, and we stand behind it. In fact, each one of our Nitro suits, whether you opt for the 1-piece Nomex suit or our 2-piece combo (Nomex pants and jacket) is designed and constructed around each customer's specific needs. 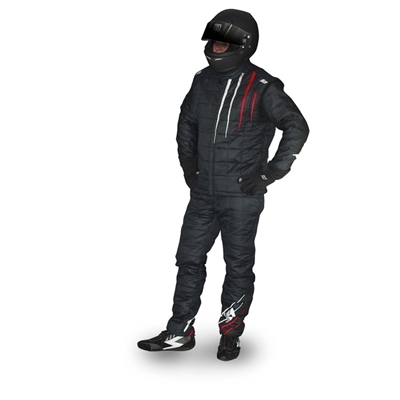 As a result, expect around a 3-5 week lead time once you order your Nomex pants and jacket. We believe that the wait time is worth it to ensure our products meet the highest standards for quality, fit, finish, and safety. Comfort – We want our customers to be comfortable behind the wheel, and one of the easiest ways to ensure this is by delivering a product that is comfortable and easy to wear. Our Nomex jacket features elastic cuffs and a smooth tapered collar for ease of use, as well as elastic under the arms for 360 degrees of movement. If your race suit is restrictive in any way, it can distract you from the task at hand – driving. Our Nomex pants feature an elastic waist to accommodate flexion and movement within the suit. This suit is the absolute best for all drivers needing this level of protection and is used by K1 RaceGear sponsored NHRA Pro-Stock driver Grace Howell, and ADRL Extreme Pro-Stock Driver Steven Boone. If you compete in sprint car racing, flat track racing, drag racing, or any other series that requires a Nomex jacket or pants, then our 2-piece fire suit is for you. Comfortable, effective, and made-to-order, our Nitro racing suits are ideal for novice and veteran racers alike. Whether you are seeking a competitively priced alternative to the industry's big brand options or simply value quality, comfort, and bang-for-your-buck, we are confident that you will not be disappointed in our Nitro 2-piece fire suit. And our Nomex jacket and pants can be purchases separately if you already have one of these items in your closet.